Management and leadership differ in a number of crucial ways. Management is a hands-on component of leadership - responsible for such functions as planning, organizing and controlling. Effective leadership is the ability to inspire followers to listen to and follow a vision. 1. How would your staff and colleagues describe your leadership style? Give me an example to support your answer. The purpose of this question is to find out if the style is congruent with the organizational culture. 2. What are the most important values and ethics you demonstrate as a leader? Give me an example of these in practice. Integrity- being truthful and trustworthy and having conviction - is an essential leadership competency. The effective leader demonstrates values and ethics in personal behavior and integrates these values and ethics into organizational practices and activities. A good leader acts with the courage of his/her convictions. While leaders are open with their employees and model honesty, transparency and fairness, they do not violate confidences or divulge potentially harmful information. 3. Name some situations in which a leader may fail. Tell me about a time when you failed as a leader. If employees are lethargic and negatively orientated it can create a situation ripe for failure. In answering leadership interview questions that explore how you deal with difficult challenges focus on how you were able to analyze the setback and seek honest feedback to learn from failure. How you used the difficult situation to encourage constructive questioning of policies and practices. Show your ability to be resilient in the face of failure and to constantly work towards improvement. 4. What role does leadership play for a manager? How have you demonstrated this? 5. Tell me about an innovative solution you developed to a non-traditional problem. Innovation and creativity are key competencies explored in leadership interview questions. Effective leaders promote change and innovation. Finding solutions to unique problems are facilitated by encouraging a constant information flow in all directions and emphasizing responsiveness to changing demands. 6. Tell me about a time when the going got really tough. How did you rally the staff and build morale? Leaders build a sense of common purpose by promoting the organizational vision both internally and externally. they develop and implement effective communication strategies within the organization. they remove barriers to collaboration and provide clear direction on priorities. 7. What methods have you used to gain commitment from your team? Leaders gain commitment by influencing and persuading the team to set objectives and buy into the process. 8. All leaders have to deal with conflict situations. Describe a recent disagreement you personally had to handle. Leadership interview questions that explore how you handle conflict are looking at your ability to understand and respect different views. demonstrate your ability to settle dispute by focusing on solving the problem taking into consideration the personalities involved. show how you evaluate the viability of the different dispute resolution mechanisms available and are able to provide support and expertise to other people. 9. How have you persuaded employees to follow your strategic vision for the organization? Leaders develop ownership by involving employees in the decision-making and planning process. they empower employees by devolving authority to get things done efficiently. 10. How have you encouraged the learning and development of employees? 11. What was the most significant change you brought about in an organization? Leaders can recognize new opportunities and anticipate long term opportunities. they are able to create enthusiasm and acceptance of the new vision or change and use the appropriate leadership style to inspire and guide employees to embrace change. Think about what the concept of leadership means to you when preparing for leadership interview questions. Look back over your experiences and select insightful examples of how you have demonstrated the competencies associated with leadership. 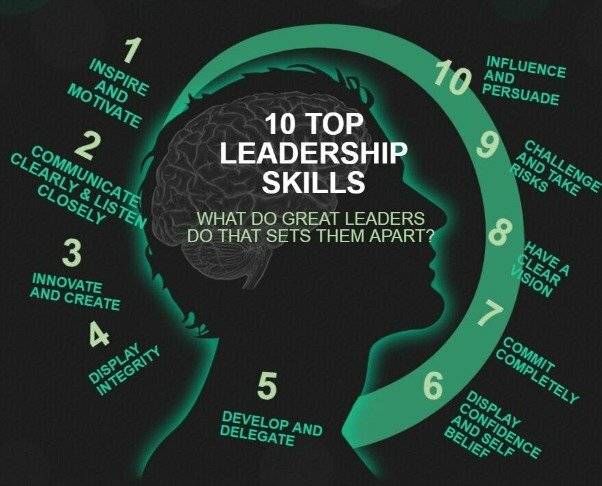 What are the top leadership skills? Leadership includes the ability to innovate and drive an organization or people towards new ideas and directions. The ability to persuade and influence, demonstrate integrity, communicate and motivate, innovate and implement strategic vision, demonstrate drive and tenacity are all recognized leadership skills. Leadership interview questions include What are your strengths? Use the excellent advice and guidelines at management job interview questions to help you succeed in your leadership interview. These common interview questions and sample interview answers will prepare you for any general interview questions you may be asked in your leadership interview.